Recorded/performed at: Studio C, 2MBS-FM, Sydney 1997-8 Nigel Butterley Christine Draeger, Kathryn Lambert 4 mins, 45 sec. Recorded/performed at: Studio C, 2MBS-FM, Sydney 1997-8 Nigel Butterley Christine Draeger, Kathryn Lambert 2 mins, 35 sec. Recorded/performed at: Studio C, 2MBS-FM, Sydney 1997-8 Rosalind Carlson OAM Christine Draeger, Kathryn Lambert 9 mins, 40 sec. Recorded/performed at: Studio C 2MBS-FM, Sydney 1997-8 Alan Holley Christine Draeger, Kathryn Lambert 2 mins, 52 sec. Recorded/performed at: Studio C 2MBS-FM, Sydney 1997-8 Alan Holley Christine Draeger, Kathryn Lambert 3 mins, 56 sec. Recorded/performed at: Studio C 2MBS-FM, Sydney 1997-8 May Howlett Christine Draeger, Kathryn Lambert 10 mins, 42 sec. Recorded/performed at: Studio C 2MBS-FM, Sydney 1997-8 Don Kay Christine Draeger, Kathryn Lambert 16 mins, 49 sec. Recorded/performed at: Studio C 2MBS-FM, Sydney 1997-8 Andrew Schultz Christine Draeger, Kathryn Lambert 13 mins, 42 sec. Liner notes include brief programme notes and biographical notes on performers. Score & Part: Hastings triptych : three pieces for flute and piano / Don Kay. Score & Part: Respiro/simple ground : for flute and piano / Andrew Schultz. 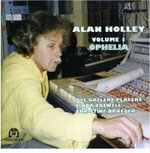 CD: Volume 1: Ophelia / Alan Holley.